One of the many highlights of our recent trip to New York was the stroll across Brooklyn Bridge, followed by Pizza at Grimaldi’s and a visit to the Brooklyn Ice Cream Factory, followed by a slightly slower walk back across to Manhattan. 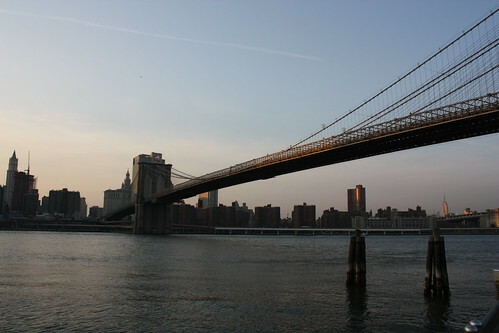 The Brooklyn Bridge is one of the oldest suspension bridges in the United States and stretches 1.8km over the East River from Manhattan to Brooklyn which makes it an ideal length for a leisurely walk. It not just tourists that cross Brooklyn Bridge on the central wooden footpath, you’ll share the crossing with cyclists who use the lane beside you and the traffic that makes it way across below you. Make sure you don’t wander on to the cycle path as cyclists fly along at quite a pace. 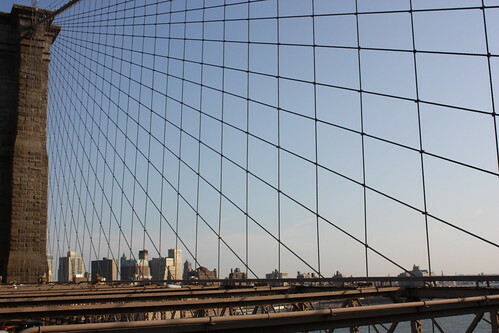 As you walk a cross away from Manhattan try and resist looking back until you make it to the half way point where you’ll be rewarded with a brilliant view of the Manhattan Skyline through the crisscrossing suspension cables. 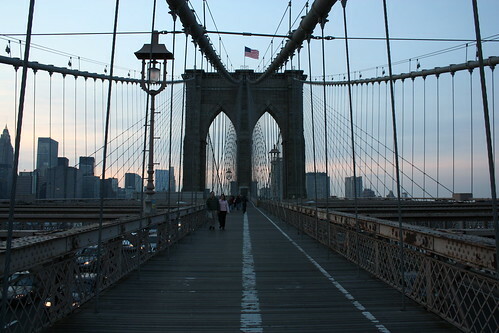 The walk across takes about 20 minutes and you will find yourself a short stroll from the famous Grimaldi’s Pizzeria (on Old Fulton St. under the Brooklyn Bridge). Since the sun was out we decided to avoid the nightclub style queue and get a takeout Pizza and enjoy it on the harbour as the sunset. Follow the great pizza with great ice cream from the conveniently located Brooklyn Ice Cream Factory and a sun set stroll back and you are left with a truly memorable experience. Awesome pictures! I love this place.